Now, do you know that that message was not the message of Christ either, so far as that is concerned? It was not Christ's message at all, actually. It was the message of God the Father. And so when we read the 5th chapter of John and verse 30, Jesus said here, "I can of myself do nothing." I wonder if you have all realized that. A lot of people never did. They thought Jesus had Power inherent in Himself to perform all miracles and to do all of the things that He did. He said that He was helpless, He was a human like you and I. He said that of Himself He could do nothing. "I can of myself do nothing. As I hear I judge my judgment is righteous because I seek not my own will but the will of him that sent me." My friends, do you know the difference between the Church that Jesus actually did build and every other church? Where is that Church today? Jesus Christ said, "I will build my church". You have a lot of churches today. Which one is His, any of them? Let me tell you how to find the Church that Jesus built. There are a lot of earmarks, a lot of ways. One thing is, Jesus Himself foretold that His Church would be a little flock not a great political power, not a great pressure group or anything of the sort, but it would be a little flock. 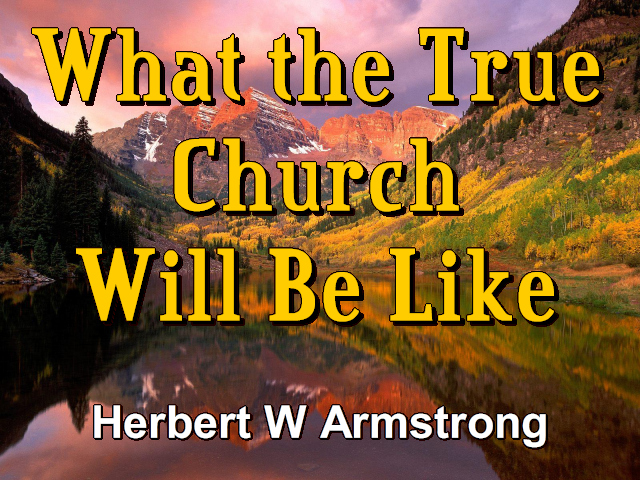 Prophecy shows and Jesus said that His Church would be persecuted even as He was. Prophecy said it would be scattered, that they would be scattered and not organized in a great powerful group or having any political influence at all. Another church is pictured in the 12th chapter of Revelation, which is a church driven to the wilderness, the desert, the mountain fastness, away from organized society by the military and the police powers of the organized state — a church that was scattered, a church that was persecuted, a church whose members were martyred. And this great church that is a fallen church was drunken with the blood of these martyrs, because that church had caused them to be killed. It didn't kill them directly. Oh no, it was merely the one that caused them to be killed. It declared them heretics and the powers of the state, the civil government, with its secret police, its military forces took hold of these Saints and put them to death after a great deal of torture, inhuman torture almost impossible to bear, and tortures even perhaps more fiendish than those that we have heard of in modern wars. We have heard of terrible tortures inflicted by the Germans in World War II and the Japanese. Well, there were tortures as bad or worse that were inflicted and that great church, yet professing to be the church of Jesus Christ, the true Church of God on this earth is drunken with the blood of the martyrs that had been tortured until dead. Why, even in Jesus Christ who never sinned, He was tempted in all points like as we are. He couldn't have been tempted, my friends, unless there was something within Him, within His mind and within His flesh that did cry out to want to be satisfied in a wrong way, unless it tempted Him and made Him want to do what in His mind He knew was not right. Only He had the will power, He had the control over self to refuse to let Himself do those things that His passions and emotions cried out to do that His spiritual mind being led of God showed Him He should not do. And also He had that power of will to propel Himself with a propulsion to do those things which He just didn't want to do and shirked from doing and tended to shrink back from but which His mind led by the Spirit of God showed Him He ought to do. Do you do that? Of course you don't always. Do you know anyone who is living perfectly like that, like Jesus Christ did? I've know people that bragged they did, but their very bragging was the worse sin of all — spiritual pride. Now, my friends, overcoming and coming to a knowledge of the Truth is something that every Christian must do. And we're told in Peter, in II Peter, it's the very last verses of Peter's letter, the 2nd letter of Peter that "we must grow in grace and in the knowledge of our Lord and Savior Jesus Christ." You go back here at the beginning of a lot of churches, take the beginning of the Protestant churches three, four hundred years ago and you find there was a leader and the people found that leader and they thought he was a great man and he came to see a certain amount of truth, that's true, but he didn't have it all. And I remember of one leader — John Wesley. And he told his people that he had not found all of the truth. He had tried. He said he had found a lot of truth. He had restored some truth he felt. But he said I haven't got it all and after I'm gone I want you people to continue to acknowledge it when you're wrong and continue to grow into more knowledge and more truth and get things straightened out better than I've gotten them. I remember the woman that didn't like me very well stopped me on the street one time in downtown Eugene, Oregon. She said, "Herbert Armstrong, you're all wet!" You know that's modern slang means you're in error, you are wrong. That was a little bit hard to take from that woman because I knew she didn't like me. I said, "Well, I don't think so, but where?" And so she began to point it out. And you know she had me stumped before she got through. Well, I said, "Now, I'm not going to just jump around at anything just because you tell me. I'm going to look into that. And if I find you're right and I've been wrong I'll straightened it out but I'm not going to just be easily be led around with any old little wisp of doctrine that comes along but I certainly shall check into it. Now, some people will say, "Well, that can't be God's Church. Why they don't even preach the same thing they used to, they've changed one or two things." My friends, you can't be God's Church if you haven't because you're not perfect. No human being ever is. And the only one that can be the true Church of God and is the same Church that Jesus founded is the Church that can be corrected by God! Have you never read what we read here in Hebrews in the very Word of God of how God corrects every son that He loves and that if we are not corrected and if we are not chastened, that we're not the sons of God? "And ye have forgotten the exhortation which speaketh unto you as unto children. My son despise not thou the chastening of the Lord, nor faint when thou art rebuked of him." "All scripture...", as Paul wrote to Timothy, "... is given by inspiration of God and is profitable..."
Oh yes, it's profitable but what for? For argument, to have your own way, chew the rag around with someone else? Oh no. But "... is profitable for doctrine, for reproof, for correction, for instruction in righteousness." But oh, how we do hate to take that kind of instruction. We don't like reproof. We don't like being corrected when we're wrong. That's what the Bible is for. Did you ever read the letters of the Apostle Paul that he wrote to the people over at Rome, (they weren't Romans, some of them were, some of them were not) and to the Ephesians and the Colossians and the Galatians and the Thessalonians and the others? Did you ever notice that every one of those letters are corrective, that Paul is correcting those church members and straightening them out and telling them where they're wrong? That's what they are. The whole Bible does that and the Bible is like a sharp two-edged sword, it cuts both ways. It's sharp on both sides and which ever way it goes it's going to cut and it hurts — it's human nature. Listen. "For whom the Lord loveth he chasteneth...", He corrects us, "... and scourgeth every son whom he receiveth." You know that isn't human nature. I believe I may have told you this before but most of you weren't listening then. I've a little grandson, he, oh let's see, I forget how old he is, this was when I believe he was only about three years old. And we had driven over to one of these grocery markets you know, these glorified grocery stores that we have in this day and age. And my wife and his mother who is our daughter, of course, had gone into the store for groceries and left the little fellow in the front seat of the car with me. And he got to playing around with the little sun shade up at the top of the windshield and I thought he was going to injure it so I told him not to do it. But he didn't pay any attention. He went right ahead. He was bending the thing all around and I told him again and he went ahead and I said, "I'm going to spank you." He went ahead, so I started to spank. He looked up to me so quick, said, "Grandpa, Grandpa, Grandpa you love me don't you, Grandpa? You wouldn't spank me if you loved me would you?" And you know before I thought I had to burst into a lot of laughing. That just caught me and after I began to laugh I couldn't spank the little fellow, but he needed it. But his argument was — you wouldn't spank me if you loved me would you? And I had to explain to him that I would spank if I loved him. And later, he says, "Well, Grandpa," he said, "Why does my daddy spank me?" He says, "My daddy wouldn't spank me if he loved me would he?" So I explained it something like this, I said, "Look, does your daddy spank other little boys?" "No." "Well, he doesn't love those little boys like he does you. Your daddy spanks you because he doesn't want you to do wrong because it's going to hurt you if you do wrong. And your daddy doesn't want you to get hurt and he wants you to do the way that will make you happy and he'd rather spank you a little bit and hurt you a little bit than have you punish yourself a lot more and hurt yourself and grow up to be the wrong kind of a man some day." Well, I think I finally got him to see it. "... whom the Lord loveth he chasteneth, and scourgeth every son whom he receiveth. If ye endure chastening..." Endure, doesn't say enjoy, does it? No, if you endure it. Oh you don't enjoy it. "God dealeth with you as with sons; for what son is he whom the father chasteneth not?" Well, in modern wacky psychology they don't believe in it. They say, "Well, let the sweet little...," what'll I call him, little brat, little... "sweet little thing, just let him do what he wants to. And just let him act on impulse." Oh boy, these psychologists don't even know human nature yet. "But if ye be without chastisement, whereof all are partakers, then are ye bastards, and not sons." I read that out of the Bible. That's Bible language. That's pretty plain isn't it? Doesn't mince words about it at all. "Furthermore we have had fathers of our flesh which corrected us, and we gave them reverence: shall we not much rather be in subjection to the Father of spirits, and live?... Now no chastening for the present seemeth to be joyous..." Oh, how true. People just don't like it, do they? "... but grievous: nevertheless afterward it yieldeth the peaceable fruit of righteousness unto them that are exercised thereby." Now, Jesus didn't teach anything of Himself. He said, "Of myself I can do nothing. I seek not mine own will but the will of Him who sent me." Every true Christian is the one who's given up his own will and is seeking the will of God! And if you're not doing that and living by every Word of God and studying the Bible to find God's will and put your own will down and out where it is contrary, you are not a real Christian. Maybe you've been kidding yourself, but you're not. And any church that isn't seeking the will of God and changing as is necessary is not the true Church of God! Why don't you apply that to yourself to find out whether you're a Christian and why don't you apply it to your church? Has it ever corrected any of its errors? Has it ever admitted it had been wrong? Has it been willing to be chastened? Has it advanced in new light and truth as God reveals it? If it hasn't and if you must answer no, it is not a Church of God but a church of this world and Satan is the god that the churches of this world worship. That's something to really to think about. That ought to knock you out of your chair. I hope you think.